PBS, pH 7.4, 0.05% sodium azide. Synthetic peptide from human CD3E. CD3E antibody was raised against synthetic peptide from human CD3E. Small volumes of anti-CD3E antibody vial(s) may occasionally become entrapped in the seal of the product vial during shipment and storage. If necessary, briefly centrifuge the vial on a tabletop centrifuge to dislodge any liquid in the container`s cap. Certain products may require to ship with dry ice and additional dry ice fee may apply. The CD3-Epsilon polypeptide (CD3E), which together with CD3-gamma, -delta and -zeta, and the T-cell receptor alpha/beta and gamma/delta heterodimers, forms the T-cell receptor-CD3 complex. This complex plays an important role in coupling antigen recognition to several intracellular signal-transduction pathways. The genes encoding the epsilon, gamma and delta polypeptides are located in the same cluster on chromosome 11. CD3plays an essential role in T-cell development. 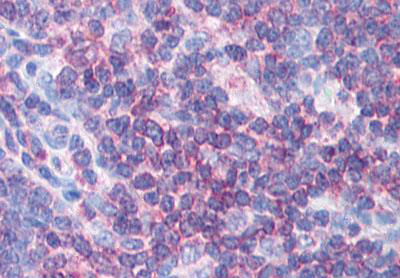 Anti-CD3E antibody IHC of human thymus. Immunohistochemistry of formalin-fixed, paraffin-embedded tissue after heat-induced antigen retrieval. Antibody concentration 5 ug/ml. NCBI/Uniprot data below describe general gene information for CD3E. It may not necessarily be applicable to this product. CD3E: a T cell surface glycoprotein that is a component of the T cell antigen receptor. The recruitment of Nck by CD3 epsilon reveals a ligand-induced conformational change essential for T cell receptor signaling and synapse formation. Contains 1 immunoglobulin-like domain and 1 ITAM domain. 1. that Nck recruitment to the TCR is fundamental to mount an efficient T cell response in vivo, and that the Nck-CD3epsilon interaction may represent a target for pharmacological modulation of the immune response.